Not to worry: Manjushree Thapa is an experienced guide, thanks to her substantial translation work—columns, anthologies and book-length works by Nepali writers. And thanks also to her impressive publication history that includes four works of non-fiction and four works of fiction, history and biography, microfictions and novels, memoir and reportage, essays and op-eds. She reports her Twitter location as 52% Nepal, 24% Canada, and 24% United States—she knows how to negotiate between-spaces in the world. Some of her characters possess this facility as well, such as Sapana, who sits with her back to the Kakarvitta bazaar, observing the bridge that spans the gap: India on one side, Nepal on the other. Thapa is just as adept at inhabiting between-spaces on the page. But rather than hinge on her capacity to write in a variety of forms, her 2018 novel focuses on a variety of voices, perspectives, boundaries and borders. The novel’s title, its four epigraphs, and its watery opening and closing scenes all underscore the themes of connection and transition. All of Us in Our Own Lives is about the spaces in which an ending transforms into a beginning, the spaces in which central characters trade places of prominence with minor characters, and the spaces in which despair transforms into hope. As characters move beyond their familiar territory to meet other characters whom readers have previously met, the narrative web loosens and tightens to accommodate changes in perspective. The connections build credibility and invite readers more fully into the story, but they also emphasize that each of us is the main character in our personal narrative, even as we play a minor or unrecognizable role in someone else’s story. Ava Berriden, for instance, is at the heart of this novel, and her narrative perspective opens and closes the work. About a quarter of the way into the story, the narrative having shifted from Ontario to Nepal, she meets Indira Sharma, who is introduced as, “one of the senior-most Nepali women in the aid sector”: this connection is key to the novel’s development even though the characters’ experiences align rather than mesh. Ava and Indira – both working in the aid sector and both Nepali, in one sense but not every sense – are conveniently poised to offer different perspectives on political engagement and power struggles in Nepal. Their professional positions also afford them the opportunity to connect with characters who possess different levels of privilege in society, underscoring themes of activism and poverty, alienation and idealism. This novel does embrace several big ideas. About belonging and community, for instance: “It was a difficult thing to love a land you could never call yours.” Belonging is presented with complexity—an emotion that Ava feels, yes, but her attachment to Nepal is complicated by the fact that she has spent very little time there after childhood. Gyanu experiences it, too, and not only about Nepal, where he was born, but also about the Persian Gulf and the desert. Another writer might fall into “Nepalsplaining” in a story like this. The character Vishwa Bista is prone to this (in conjunction with his habit of mansplaining) when he is working with Ava. More than one character could regularly contribute observations like the following to the narrative: “Especially with our ongoing commitment to donor harmonization … it isn’t enough to incorporate the MDGs or the PRSP or even the CSP and CAP.” A spattering of this kind of expertise is character-building, but any more would be off-putting. For the most part, Thapa avoids jargon and “Nepalsplaining” by channeling Ava’s desire to understand. When she is encountering the reality of life in a place she has not lived in since she was a girl, she repeats salient facts to resituate herself, providing context to readers as well—even, on occasion, in the form of a statistic, such as when Ava reminds herself that less than 5% of rural Nepal is electrified. Readers can spot the terms that might, in another novel, be banished to a glossary; it is refreshing to experience them in the narrative without the disruption of either italicized text or footnotes. This approach allows readers to more immediately participate in the “small beauties of the world,” a phrase from Thapa’s Forget Kathmandu: An Elegy for Democracy (2005). 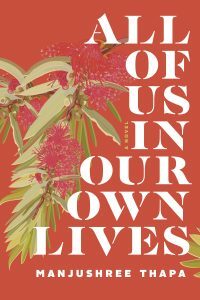 If what all of us read in our own reading lives can change the world, then reading Manjushree Thapa’s All of Us in Our Own Lives is a step, buoyed by imagination and compassion, moving us toward transformation.